Since I’ve committed to spending most of the winter working on dressage on Moe, I thought I might as well keep things interesting by checking out a dressage saddle for a test ride. This is a fascinating concept to me. 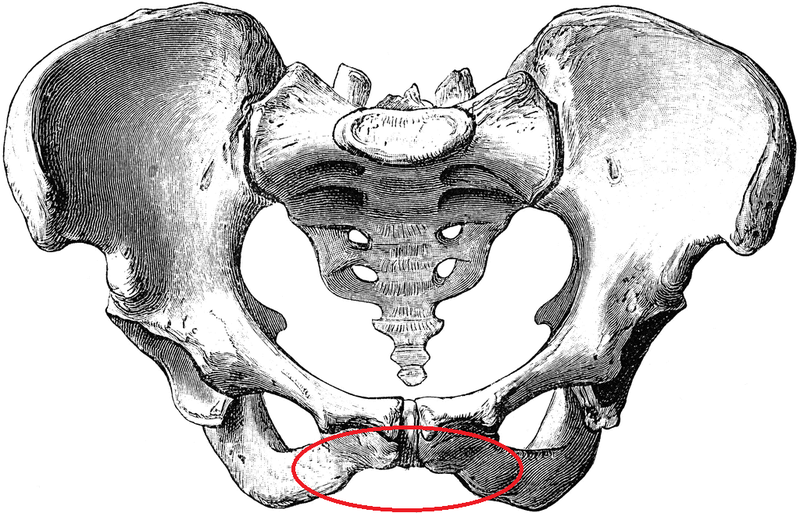 Women and men do have differences in their pelvic structures: women have a larger and broader pelvis and the distance between the sitting bones is also much wider in women than in men. I was extremely curious to try out a Schleese. I selected one in an appropriate seat size and tree width, and off to the barn I went. I’m not sure which model it is; it’s listed as a semi-custom saddle in our inventory. It’s stamped with several numbers and the name “Marion Abell”. (I don’t know what that indicates; the store has a similar Schleese stamped with “Millington McCoy”, so perhaps it’s the name of the person it was made for?) 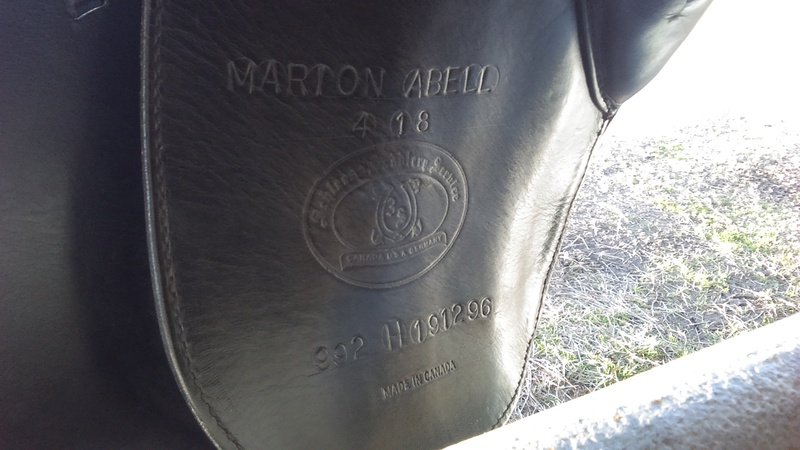 The serial number indicates this saddle is built on a Hennig tree, which makes it at least 10 years old as Schleese stopped using the Hennig tree in the mid-2000s. Since Schleese charges $75 to find information about their saddles, I opted not to email them for more information. The saddle is beautiful; it’s lovely leather that’s supple and soft. The block is an interesting triangle shape that’s moderate in size. The seat isn’t especially deep, and it looked to me like the pommel was awfully high. It looked a little more even once it was on Moe’s back, but I was still concerned it would put me into a chair seat. At the walk, this was horrible. With every step Moe took, my pelvis dug into the saddle uncomfortably. At the posting trot, the feeling disappeared. The sitting trot was an improvement on the walk (how often does that happen? ), and the canter was tolerable. The saddle’s balance was better than I’d hoped it would be; I didn’t feel like I was in a chair seat, but it didn’t feel like it pitched me forward, either. The seat of the saddle itself was hard as a rock, reminiscent of an old Stübben or Passier. My biggest problem with the saddle, however, was the way it made my leg hang. While I felt like I had reasonably good contact with my thighs, my lower legs seemed like they were a foot away from Moe’s sides. I struggled to make contact with my calves or my heels to nudge him into a faster gait. Forget about lateral work- I couldn’t press my leg to his side without serious effort and wiggling. For his part, Moe seemed fine with the saddle. He didn’t show any signs of discomfort or displeasure, and he tolerated my clumsy leg aids with his usual good nature. Schleese saddles might be a great fit and a popular option for many people, but they definitely aren’t for me! Very interesting. I watched a ton of their videos when I was dressage saddle shopping (which has been put on hold…womp womp) and thought they sounded comfy. Sounds like you’ve reinforced my don’t buy anything without a trial mindset. It’s awesome that your job lets you try them out! If I were limited to a single piece of saddle shopping advice, “take it on a trial!” would be it! I was REALLY surprised at how much I did NOT like riding in this saddle. Plus, saddles are such a personal thing. Different people have different preferences. And sometimes, I think people get SO hung up on how it fits the horse that they forget that they’re also supposed to be comfortable! I am very glad work encourages me to take saddles out on trial- it’s one of my favorite parts of the job! Yah I can’t stand most Schleese’s. They make me feel so uncomfortable and I can’t find a place to sit. I feel very much on top of the horses. Granted, I don’t have the most girlish of figures so I’m not sure how much their womanly saddles apply to me, but still. I also have never seen their fitters (though granted, I have had little experience with them- only two horses) actually fit a horse correctly. My client has one now and the tree is WAY too narrow for the horse (the tree is interchangeable so it should be close to perfect!). I’m going to force my way into the next saddle fitting and make some demands. Definitely good advice to always try a saddle before buying it! Interesting to hear about their fitters! I haven’t had any firsthand experience with them. I’m always a little suspect of any saddle fitter that’s affiliated with a certain brand, since their ultimate goal is to sell a saddle. I’d be interested to hear how it goes if you’re able to get to the next fitting for your client! They aren’t for me either. I had a pretty similar impression! It’s a bizarre slogan; I’ve never ridden in a saddle (other than this one) that was actively painful! So I’ve toyed with getting a budget friendly dressage saddle (like Wintec cheap) since I’m flatting more and was talking to another trainers WS about them. She swears by her Albion she just happened upon but said she hated Schleese with a passion. She rides in all saddles and on many different horses so I took her opinion seriously. I agree test rides are imperative for getting the right saddle. The dressage barn where I board has a LOT of Wintecs across all ages and levels of riders- everyone seems very pleased with them! To that I say — in WHAT universe is having your pubic bone touching the saddle a good dressage seat? 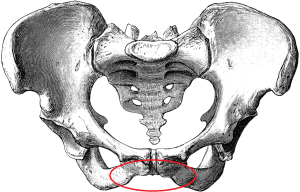 The diagram of the pelvis you put in this blog CLEARLY shows that the pubic bone is HIGHER than the seat bones, so if that is a flat triangle then you’re either way tipped forward or your back is majorly arched! Likewise, if all three are in contact with the saddle in some different way… well, sounds like exactly what you are describing! And not comfortable, to me. It makes for interesting thinking. Now, someone who loves Schleese please speak up and tell me why you love them!! That doesn’t even make sense! Maybe that’s what this saddle IS trying to accomplish; I could certainly feel both sitting bones and the pommel was so high that my pubic bone was making contact with the saddle. The saddle didn’t put me in a BAD position, per se, but it was very uncomfortable and I would NOT want to ride in it again. I’m interested in hear from Schleese fans, too! I’ve never sat in one on a horse, only on a block, but I didn’t find it comfortable either. I also found it interesting that a lady doing Intro told me about how a custom Schleese was the best $7000 she’d ever spent on a saddle. !?!?!?!? YES! The woman I know who has a Schleese also rides at Intro level. What?! Your opinion is one that I have heard frequently about them. I can’t believe what some people are willing to shell out for them! Okay. 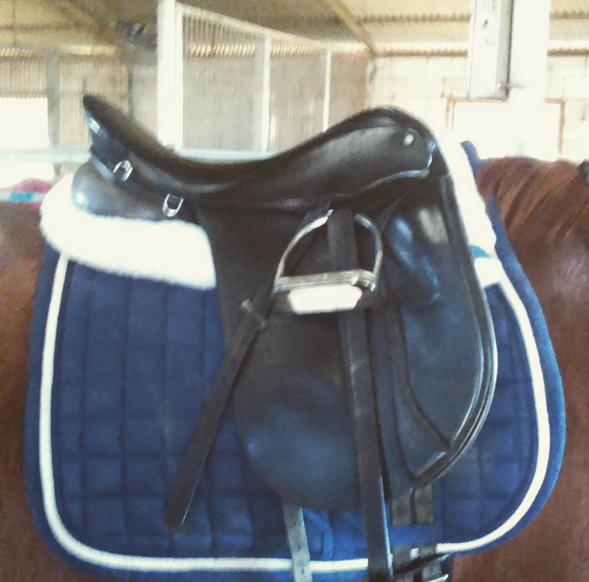 I love my Schleese mono-flap eventing saddle. 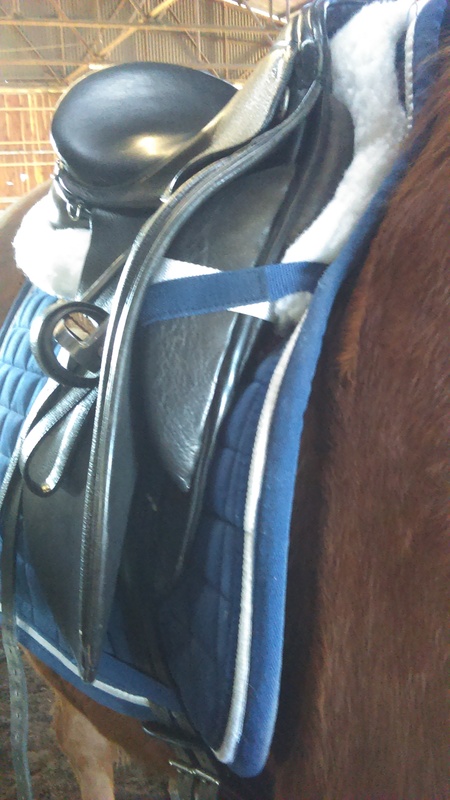 Granted, I paid less than $1k for it used (I’m not sure that ANY saddle is worth $7K) but it fits me and my horse really well and the balance is great and it’s very comfortable. As a foxhunter, I need a saddle that I can ride cross country for a couple of hours, and stay off my horse’s back for a lot of it. Haven’t ridden in their dressage saddles, so I can’t comment there.